International Women’s Day, from its founding, is a day rooted in the fight against war and occupation, from the years leading to the first world war and through the many brutal wars the world has seen up to today. For over 100 years International Women’s Day has been marked with the heroic struggle of women for equal rights, fair working conditions and the right to work, suffrage and against violence against women. Under war and occupation, women are the most impacted as they face physical and sexual violence, and struggle to protect and provide for the families that they are the center of. But under such circumstances women are known to take the lead in struggles for liberation and against war and occupation. Around the world today women are taking the lead in struggles for a better world! 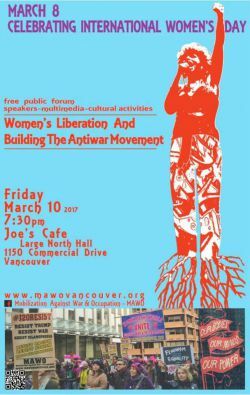 Join MAWO in celebrating International Women’s Day with a evening of multimedia, speakers and cultural activities.